HONG KONG—On the same day that pro-democracy protesters suffered the worst setback of their movement, with the police seizure of a key arterial road, they parried with a sudden and unexpected thrust on another front, storming a tunnel on the crucial Lung Wo Road that connects Hong Kong island with the rest of the city. The tunnel on Lung Wo Road had not been in play for some time, because of the controversy in the movement about occupying it. Lung Wo, and the artery known as Queensway, are the only two major roads that connect Hong Kong island with the mainland. Two weeks ago when the first occupation around government offices in Admiralty began, protesters talked about, and at one point tried to seize it, but the moderates who counseled restraint won out. Blocking both Queensway and Lung Wo would paralyze the city and push police into using force to clear one or both of the channels. But after police launched their own surprise attack on Queensway on Tuesday morning, chainsawing through the elaborate bamboo roadblocks that had been lashed together overnight, that calculus evidently changed. At about 10:00 p.m. the first attempt to block the road was made by a group of what seemed to be rogue and aggressive young men, some of whom donned face masks and tied towels around their heads. Others disagreed with them and arguments ensued about the wisdom of the strategy. Eventually the road was rushed by the crowd. At one point Paul Edmiston, commander of the Hong Kong police unit Delta Company, waded into the crowd and attempted to mediate the dispute between the two protesting groups; he was quickly hemmed in and jostled by dozens of young people who yelled slogans while holding their hands up. The moderates managed to see the barriers removed, and the situation appeared to calm down. 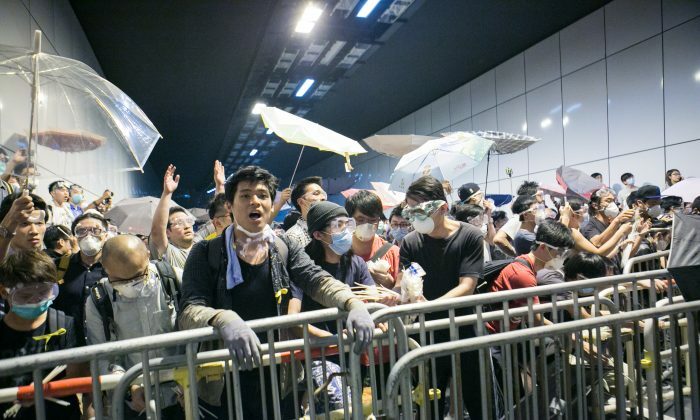 The principle of non-violence has been a key idea, and rhetorical device, for the occupy movement in Hong Kong—but if those that stormed the tunnel did not swing punches, they were at least aggressive and physically confrontational. After a short impasse, just two protesters suddenly began dragging a few metal barriers onto the road—and the rush was on. Hundreds quickly filled the left lane, as water bottles, face masks, and boxes of goggles were tossed by peers gawking from the planter beds above the roadway. About five minutes later, the other side of the road was blocked off. Police use of pepper spray and batons did little to deter the onslaught. Soon the entire tunnel had been taken, and the police, who had by then been trapped in it, made their retreat. Once the new battle-line had been drawn, protesters again began erecting their barricades—metal police road-blocks forced together and atop one another with plastic zip ties. Participants and onlookers widely saw the seizure of Lung Wo tunnel as just deserts for the government’s own capture of Queensway in the morning. Occupiers had only the night before exalted in their craftsmanship of deep and high bamboo roadblocks, which used rubbish bins as joints, and chains, plastic ties, and concrete as joiners. All were unceremoniously hacked up with police chainsaws and hauled away in trucks in the morning, as most occupiers slept, before they could martial a sufficient response. That action was widely seen as “unfair,” and particularly galling, because the government had been offered Queensway in exchange for the occupation of Civic Square, a forecourt area of government headquarters which has traditionally been a public gathering place. It was fenced in after protests there in 2012, and is now a no-go area for occupiers. Their proposal for a swap was rejected, and police instead simply took Queensway. In that light, the hesitancy some had with rushing the Lung Wo tunnel was outweighed by the broader strategic considerations of the movement, such as they are. “This was a response to what they did. This is to force them to talk with us,” said a 22-year-old social science student, who would only be identified as Mr. Chan, because his parents don’t want him involved in the occupy movement. He reluctantly agreed that taking the tunnel was necessary. But whether it was a plan conceived of in advance by student leaders is unclear. There is probably not much doubt that student organizers knew of it. Even before the roadway was fully seized, the idea had been discussed on social media used by protesters, according to some participants, who flashed a view of their WhatsApp conversations. Standing out from the crowd of mostly young Hong Kongers were a couple from Shenzhen, the town just across the border from Hong Kong in mainland China. They were visiting the city for a spot of shopping—the lady sported a pink and leopard-patterned purse, and had that day purchased a Jigott “Angels in the Sky” Skin Whitening Kit—and to take in the protests. Her partner was eager to praise the orderliness, cleanliness, and dedication of the protesters. He and his partner helped carry water and face masks for the protesters, who were anticipating a dose of pepper spray and tear gas. The pair run a transportation company in China, and declined to provide their names because of the political sensitivities of speaking about the protests, which have in China been called a hostile foreign plot and a threat to Communist Party rule. Spun off from the larger effort to obtain universal suffrage for Hong Kong, a controversy over the meaning of the rule of law has broken out. Day 18 of the Umbrella Revolution got off to a violent start as Hong Kong police start to clear out peaceful pro-democracy protestors.